As Alila Bangalore jumps into the contemporary culinary trend of cooking with locally sourced ingredients, we also check out some global hotels spearheading this trend. The ‘Farm to Table’ concept ensures dishes are made from fresh and locally sourced ingredients and highlights the connections between plate, people, planet and community. As the concept gains ground globally, Alila Bangalore has joined the movement and is now offering this contemporary dining experience to its guests at Tiffin Room. The menu at Tiffin Room in Alila Bangalore has been designed to complement the best of Indian produce. All the key ingredients are sourced from Indian farmers with organic farms. The menu features distinct Indian flavours crafted so as to lend a global flavour and character. 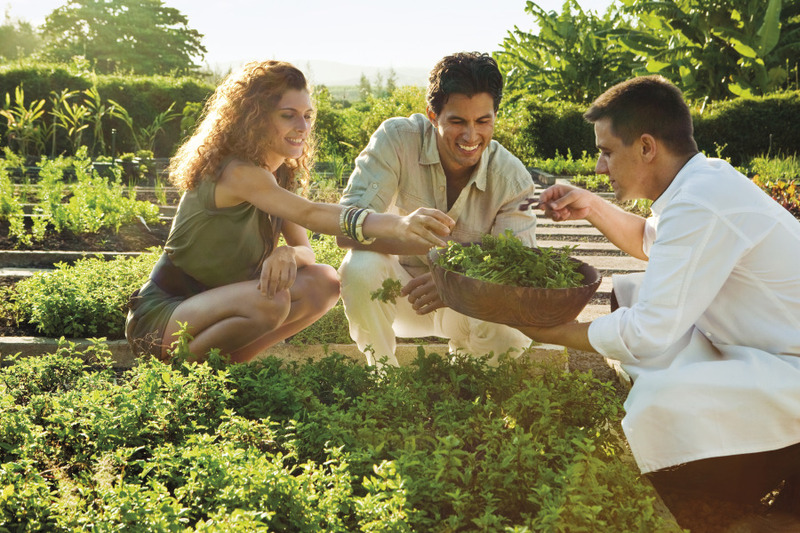 Around the world there are hotels that are not just sourcing local vegetables but also producing them in their own backyard and terrace farms. Chatham Bars Inn, USA, has an eight-acre farm about ten miles from the hotel. Guests are invited to walk the grounds and even pick out items, which the Chef then specially prepares for them. Currently, the farm produces a variety of lettuce, kale, summer corn, squashes, carrots, eggplants, and just about any other herb or vegetable that you can think of, including more than 30 varieties of tomatoes. Shanti Maurice – A Nira Resort, located on the south coast of Mauritius, cultivates a herb garden that produces aromatic herbs such as rosemary, marjoram, lemongrass, mint, parsley, basil, and coriander, as well as several vegetables and fruits. They have a special programme called the Herb Garden BBQ, which includes a special tasting menu, tailored wine flight and service by a personal butler and chefs. Italy’s Terme di Saturnia Spa & Golf Resort, maintains a garden that produces a significant amount of ingredients supplying its two restaurants and the staff canteen. The garden yields items such as zucchini, cauliflowers, tomatoes, eggplants, different varieties of lettuce, fennel, cucumbers, artichokes, peppers, herbs such as basil and parsley, as well as raspberries, strawberries and blackberries that go into delicious desserts. The hotel also produces olive oil from its own trees! Saxon Hotel, Villas and Spa in Johannesburg, South Africa, has an organic rooftop garden that supplies almost all required ingredients to its fine dining restaurant – Saxon five hundred. The garden produces all varieties of herbs, including lemon thyme, lemon verbena and five types of basil; rhubarb; beans; lemons, pears and apples; tomatillos; gooseberries; purple broccoli; globe artichokes; 25 varieties of tomato; asparagus; yellow marrow; beetroot; fennel and fennel flowers; parsnips; gem and butternut squash. Guests can take master classes where they spend the morning with the Chef in the garden followed by a cooking demonstration in the restaurant kitchens. Guests can also share a seasonal barbeque out in the garden with the Head Chef David Higgs. Several more hotels are following the farm to fork philosophy and we at LifeSpice are sure glad that this seems to be a trend that seems set to one day become the norm. Tagged Food, LifeSpice, Luxury hotels, Luxury Travel. Bookmark the permalink.